Don't miss this informative webinar hosted by WSC and featuring Mandy Galante is the CyberStart Program Director for the SANS Institute. Mandy will share vital information about CyberStart Program, for high school girls, and Cyber FastTrack for college students. Both programs are 100% scholarshiped for students and open for registeration in April 2019. Have you been thinking about transitioning to a career in cybersecurity, but are not quite sure how to make your dream a reality? Are you currently working a cyber job but want to make a plan for advancement? This program walks you through the steps that you need to take in order to explore your cyber career options. It gives you a structured framework for exploring your interest in cyber, researching cyber positions, learning about cyber policies and standards, learning cyber tools, obtaining cyber / IT certifications, as well as applying for cyber jobs. This approach helps you to create your own cyber career action plan so that you can position yourself to join the field of cybersecurity. Join Teresa Allison, CISSP, CISA, Security+, PMP; ISSA DC Chapter, VP of Strategic Relations; & Cyberjutsu Award Winner, for an interactive discussion on building your Cyber Security Action Plan. Maggy Powell is the Senior Manager, Real Time Systems Security for Exelon. Her teams include security engineering, a security operations center and security compliance focused on real time systems across the enterprise. She is responsible for vulnerability assessment, threat management and incident response for industrial control systems and operational technology as well as compliance fulfillment for applicable CIP cyber security standards. Join us at our next Career Conversations session. We&#39;ll discuss topics such as: what made them decide on IT or Cyber Security, what were some of their work/life challenges, and what skills and education do they see as essential to success? Fellowship serving the Federal CIO in supporting cybersecurity policy analysis and legislative review, including stewardship of the Open Data Initiative and help in giving “birth” to the United States Digital Service (USDS). She’s an ardent advocate for new approaches to hiring talent into and rational applications of security strategy and technologies for the Federal government space. 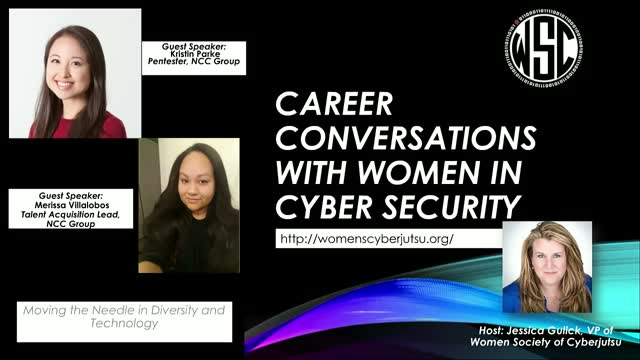 The Women’s Society of Cyberjutsu (WSC) is a non-profit, 501c(3) organization passionate about helping and empowering women to succeed in the cybersecurity field.